I recently wrote to you about a fishing trip that we had to Te Arai point with some friends of ours. This inspired us so much that we decided to buy our very own kite. We bought the kite at the end of February and have had some excellent catches. Most day's have produced some great fish - even when all around us seem to be catching nothing!! Must be beginners luck! The photo below is from one of our recent trips to Te Arai. Its of my mother in law who is over with us from Wales. She goes back in a couple of days time and will really miss kite fishing every weekend. 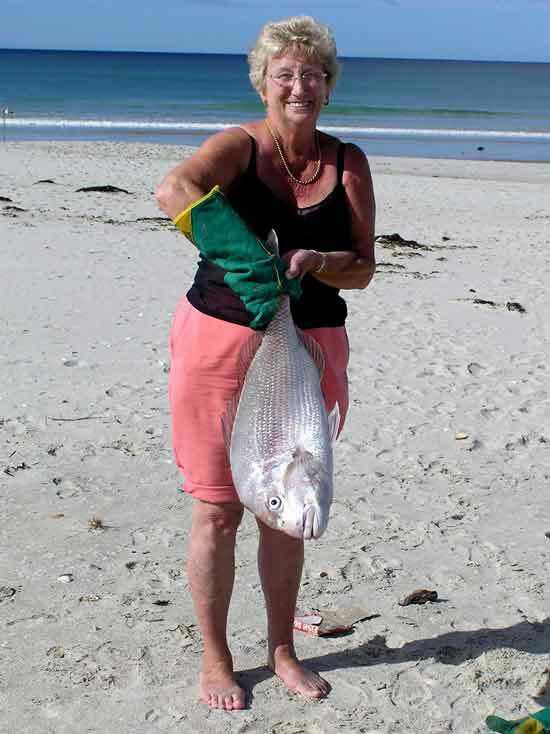 This particular day was a great one with this snapper of 6.5kg plus 12 others all of good size. Easter holiday time saw a friend of mine come over from the Gold Coast. Bruce Scott and Leon Chaney came over for a break and to do some serious fishing. Both these guys are right into fishing. Bruce has a 6.3 metre smuggler with a 225 hp yamaha on the back and Leon with a 32 foot mustang. 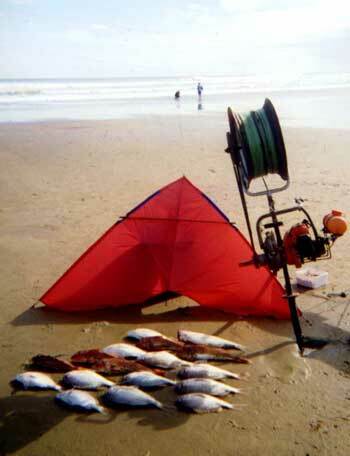 Anyway, we had a trip to the east coast kite fishing and only got one gurnard. The next day we had a trip to the hen and chickens with "Cool Kiwi". We had a great day. Got our limit of snapper plus 2 trevally. You wouldn't believe it, the next day we were going to fish the Kaipara but it was too rough so we went to Glinks Gully as we had a 15 knot northeast wind. It was so lucky as I really wanted to show Scotty how good this spot is. We got 15 snapper, 6 gurnard, 1 kahawai plus a huge stingray which must have gone 25 kgs plus on the kite longline. Bruce and Leon couldn't believe their eyes as the hook section came in with a string of fish splashing about. They were really impressed. I think they were going to tell half the Gold Coast about it! At Glinks Gully last weekend a rouge wave rolled over an 18 foot boat as they were trying to negotiate the surf to go out fishing. Although a lot of boats do this quite successfully, many times, its worth noting that the dangers are there. The boat sunk and luckily the boaties made it to shore in one piece. Now, the wreck may create a potential snag for kitefishers in the area. The exact location of the boat is unknown however it is reported that the majority of boats are launched straight out in front of the entrance on the beach or slightly to the right of the entrance. This is also the direction the rip generally runs along the beach, towards Manganui Bluff. It may pay for kite, kontiki and submarine fishers to stay clear of the area north of Glinks for a while. Hi there, Geoff Preston here from Mokau. The last few months have been a bit of a write off in Mokau for kitefishing with big seas and onshore winds. This week conditions have improved a lot with good ofshore morning winds and one to two metre swells. Both myself and a few other locals have had good catches. On one set on Monday, with fresh kahawai bait, I hooked 23 gurnard which is my best gurnard tally from a 25 hook set. Tony Johnson caught 17 gurnard and one snapper off his set while Ross Clements, fishing the day before, caught 6 snapper and 5 gurnard. There are a lot of gurnard being caught by the boaties also but snapper numbers are down at present for this time of year. If anyone is keen on finding out more about our local conditions here, about accommodation in Mokau or even kitefishing trips, please give me a call on 06-752-9780. I finally got out for a fish after the shocking floods we had here in April. The area I fish has only just become accessible again due to the amount of rubbish washed out in the floods. We gave it plenty of time to clear to reduce the chances of getting the kontiki snagged. The day dawned fine and calm seas. After baiting up with octopus we set the kontiki out to 1200 meters offshore in 15 minutes with no problems. We left it out for 50 mins and hauled it in using my electric winch which I have been using for 6 months now, it sure has taken all the hard work out of retrieving the line! We caught two snapper, four gurnard, eight kahawai and a couple of small sharks on the first set and did another two sets on the day for similar results. I have found it pays to fish the incoming tide or half tide in this area as the current picks up making it hard to get straight sets at other times. No snags have been reported from our beach so far and with eight kontikis fishing the area it looks like it might be clear. HereÕs hoping the weather stays good and the spiny dogs stay away for a while yet. Just a quick one to let you know what is going on up Waipu Cove. The snapper are everywhere! On Wednesday 5th May it looked promising with a few small schools of kahawai working about 100 meters offshore, the tide was coming in and the wind was from the northwest. Being a little short on cash for bait I grabbed a dozen tuatuas at low tide and tied them on to the 5/0 target hooks with some cotton. I only did one set of seven hooks with my flexiwing rig and the rig wound up around 45 degrees offshore. Despite fishing this shallow angle the result was a four kilogram snapper and we could have possibly had another one on as well because the line suddenly went slack after a big pull. On Thursday I managed to get some mullet for bait, the wind was very light when we arrived so we put the skyhook on. I later regretted this decision as the wind got up while the gear was out and it was really hard to pull in it in, the two litre milk bottle was lifting about ten metres out of the water at times. It was worth it though as we caught two snapper, one a little smaller than the one the day before and a just legal sized one, which we put back. The bad news is the red sack weed had started to come in and the rocks are covered in the stuff, fortunately only small amounts were getting caught on the hook section of our dropper rig. Good luck to all the keen winter fishers. We sent the Seahorse Kontiki out a full kilometre on the first set but caught only one pannie and discovered the dreaded red sack weed was back in the bay. It's not pleasant stuff, and is a right bugger to get off your line! We decided to cut the timing on the sub back to ten minutes which gave us a setting distance of around 600 metres out. This worked a treat and 14 snapper found their way into the chilly bin. We used the same system over the next few days to good effect and over six sets averaged 7 fish a time. We caught a total of 41 fish all up including two kahawai for the smoker. All snapper were in good condition with a number around the 2.5 to 3kg mark. 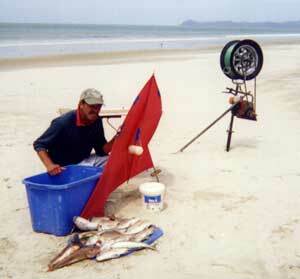 Mathew Grant fishing further up the beach at Uretiti reports catching three good snapper on his big dropper rig. Robbie CullenÕs son, Jamie, went kitefishing at Uretiti Beach on May 4th and despite being a full moon the fishing was good. Jamie set the gear to 1000 metres offshore and wound up with 5 snapper ranging in size from 1 to 3.5kg using sprats soaked in bonito oil and green rock salt for bait. On May 1st Mike fished his 65kg kite dropper rig at Muriwai in perfect conditions, a strong northeast wind was blowing, the surf was moderate and there was no rip. The wind was so strong Mike needed two, two litre bottles of sand and three rolling weights to just keep the gear in the water. After baiting up with squid the gear powered straight out to 1000 meters offshore. After retrieving the gear Mike was amazed to see a fish on every hook, eight snapper up to two and a half kilograms, and two gurnard. Having caught plenty of fish from just one set Mike packed up for the day and headed home to clean the catch. I got to my spot about two kilometres north of the Rimmer Road access around 3:30pm. Conditions were perfect, a light north easterly was blowing and there was no surf or rip. I only had time for one 10 hook set of my kite dropper rig so I quickly baited the Target Snapper Hooks with mullet and set the gear 1000 meters out, it wasnÕt quite straight but this made no difference, the fishing was great! I caught five snapper, three gurnard and a kahawai - nine fish on ten hooks. I didn't want to risk another set and possibly stay too long because they close the access gates there at 6:00pm. On Easter Monday we had an evening fish, it was the first time we been kitefishing for a while. There wasnÕt much wind and the beach had a lot of weed washed up on it. We went down the south end of the beach and gave our mate Ross Kay a hand with his kite rig. We put out his longline rig with only 10 hooks and left it out for 20 minutes as the wind seemed to be dropping, when we got it back on the beach there was 3 nice snapper on. We were all happy as we had our tea! There were four other kite fishing rigs further down from us but I am not sure how they got on. Electric Kontiki fishing systems don't get better than this one. 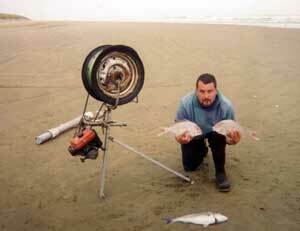 Just what's needed fish those calm days or with on shore winds on the east coast. Holds over 3,000 meters of 150kg mainline. Super strong aluminum tube construction. On/Off/Pulse switch with automatic cutout for safety. Check out our new Spectra pages on site now. Learn how to tie this super strong line and which knots are best and why. New Spectra knots, spectra fishing line facts, line testing results and much more.